For the stage that originated in Super Smash Bros for Nintendo 3DS, see Dream Land GB. Dream Land (SSB) as it has appeared in the Smash series. Dream Land (プププランド, Pupupu Land) is a stage that debuted in the original Super Smash Bros.. It returns in Super Smash Bros. Melee with the name Past Stages: Dream Land and is unlocked by beating Target Test with every character. It is also available in both versions of Super Smash Bros. 4 as downloadable content and in Super Smash Bros. 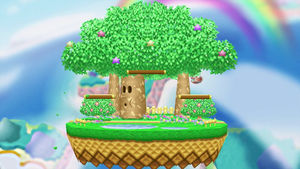 Ultimate; in those games, as with other returning stages from the first Smash Bros. game, some of the textures are slightly higher in quality, but the general overall primitive look of the original is retained. In the original Super Smash Bros., Dream Land is Kirby's home stage, the location of Stage 7 in 1P Game, and also the stage where Ness is fought while being unlocked, possibly because both characters come from games developed by Smash 64 developer HAL Laboratory. Kirby Beta Stage 1, Kirby Beta Stage 2, and the How to Play stage are all similar to this stage and can be found in the debug menu. The stage features three static floating platforms above a main one, a simple layout which in later games was inherited by Battlefield. 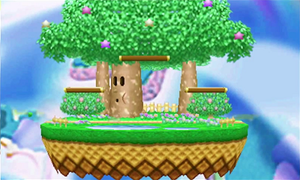 Whispy Woods, a recurring boss in the Kirby series, is also in the middle of the stage, facing left. He will blow wind toward one side of the stage every so often to affect the battle. His wind seems a little less powerful than it is in Melee's similar stage Green Greens, where he can blow characters off the ledge. Bronto Burts and King Dedede can also be seen flying in the far background as cameo appearances; although when King Dedede himself is present in the match, he won't appear. In Super Smash Bros. for Wii U, Whispy will blow characters left if they're in the blue box, and right if in the red box. Note that the top platform is not affected by Whispy and the boxes are not symmetric, as they meet where Whispy is located, on the left-center part of the stage. The Ω form removes the three soft platforms, extends the length of the stage slightly to match that of Final Destination, and completely flattens out the ground, meaning that tripping now behaves normally rather than only working when pushing opponents away from the centre. Whispy Woods still turns and blinks, but will not blow wind anymore. In Super Smash Bros. Ultimate, the Ω form and Battlefield form are similar to SSB4's Ω form; however, it is resized and reshaped to match Final Destination and Battlefield, respectively. The three soft platforms of the Battlefield form are based on the ones in the normal form. Whispy Woods, as he appears in Kirby Super Star. This stage is loosely based on Green Greens, which is located in Dream Land, from Kirby's Dream Land and Kirby Super Star's Spring Breeze. Whispy Woods, a sentient apple tree, first appeared in Kirby's Dream Land as the first boss and has appeared in numerous Kirby games since. In most games, he attacks by dropping apples over Kirby and shooting gusts of air at him. 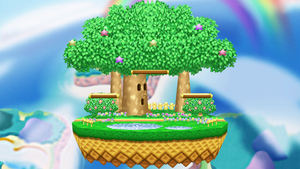 In this stage, Whispy Woods still blows out air, but this only pushes fighters without damaging them. King Dedede is a recurring antagonist in the Kirby series. One of the attacks King Dedede uses in Kirby's Adventure and Kirby Super Star is to puff up and try to ram into Kirby. King Dedede can be seen flying in the background of this stage puffed up, and he looks similar to his appearance in Kirby's Dream Land 3. Bronto Burts are a common enemy throughout the Kirby series as well, and one of them can be seen flying across the background of this stage; resembling their design in the concurrently-developed Kirby 64: The Crystal Shards. This stage is universally neutral, and is currently the only legal stage in most rulesets. The general given reason why it is legal is that it is the most "balanced" or "standard" stage, with a basic layout and size that makes it less campy than Hyrule Castle or Congo Jungle. The stage also has only one type of hazard (the wind), which barely affects gameplay compared to the tornadoes on Hyrule or the barrels on Congo. This stage is also currently the only legal doubles stage. In general, the majority of the cast benefit heavily on this stage outside of Link, due to its small size and potential for characters to get early gimps or start early combos to rack up high damage. The stage is very good for quick 0-death combos, as well as characters who can combo into an edgeguard/gimp easily, such as Pikachu or Captain Falcon. Link is considered worse on this stage than Hyrule due to the much smaller size, giving less space to projectile camp, which he uses to disrupt opponent approaches and set up the eventual close combo when the opponent is vulnerable. The stage was originally thought to be a bad Fox stage as well, but this is debatable as top level Foxes are still making high placings even with Dream Land being the main (or only) legal stage. This stage is neutral in Melee as well. The stage is slightly larger in Melee than it is in Smash 64, along with having a much higher ceiling. This is generally considered the best stage for Peach, Jigglypuff, Ganondorf, and Samus (against certain characters), and is considered a bad stage for Marth and the Ice Climbers. The very high ceiling of the stage provides a large advantage for floaty characters, as it makes them significantly less vulnerable to quick vertical KO setups, such as Fox's up throw to up aerial combo or Marth's up tilt. Additionally, the large stage size and higher platform placement compared to other three-platform neutral stages allow for greater flexibility in movement and spacing, especially for characters like Captain Falcon, Fox, and Falco. The placement of the highest platform also serves as an outpost for certain characters to escape pressure, allowing easier camping and employment of defensive strategies. Due to this, Dream Land greatly benefits players who are stronger in the neutral game, and generally fosters slightly slower and more methodical gameplay compared to smaller neutral stages. However, Dream Land hinders characters who rely on platform pressure or require close quarters to pressure opponents. The Ice Climbers are perhaps the most hindered by this, as their harder matchups become even more difficult. 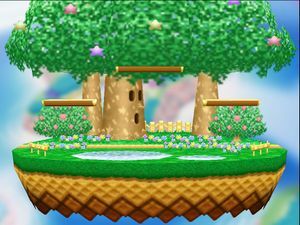 The large stage size gives characters like Fox and Peach more room to camp them, avoid wobbling, and employ hit-and-run strategies that they cannot properly combat due to their poor aerial game. Marth is also hindered by Dream Land; while the stage enables him to make better use of his movement, the higher platform placement makes it harder or impossible for his grounded attacks to strike through them from below, hindering his ability to pressure opponents on platforms. Dream Land has shrunk to about the size of Battlefield, evident by Star KO'd characters now being obscured by Whispy Woods. For the first time, it is not a universally neutral stage; though the blast lines are actually average in comparison to Smash 4's other legal stages, the top platform is much closer to the ceiling compared to Battlefield. As a result, the stage favors characters with primarily vertical finishers, such as Zero Suit Samus, Meta Knight, and Ryu. This advantage has resulted in the stage being viewed as less fair than Battlefield, and with Whispy Woods as the only stage hazard, some tournaments feature Dream Land as a counterpick. Only one tournament, Super Smash Con 2015, has banned Dream Land (64) entirely. Oddly, the stage acts as though the main platform is slanted slightly towards the centre of the stage, and this has the effect of causing moves that would ordinarily launch at an angle of 0 degrees to very briefly lift the opponent off the ground if launching them towards the centre. This also means that such moves cannot cause tripping if they knock opponents towards the centre. Dream Land is no longer legal due to many stages that are similar to Battlefield being excluded from competitive play. King Dedede in play and in the background in for 3DS. In Melee, when Whispy Woods blinks, certain characters will experience animation errors in their attacks. Sometimes, a Dedede will begin his flight across the back of the stage before another Dedede (going in the opposite direction) finishes his, causing them to overlap and appear at the same time for a moment. In Super Smash Bros. for Nintendo 3DS's Training Mode, there is a glitch where Dedede can appear in the background even if he is participating in battle, while he is not supposed to. Also in Super Smash Bros. for Nintendo 3DS, while characters being Star KO'd are correctly layered behind the tree, their highlight (if it's turned on) is not. Dream Land as it appears in SSB. Yoshi and Fox on Dream Land in SSB. A prerelease version of Dream Land in SSB with various aesthetic differences. King Dedede's cameo in the background of the Dream Land stage. Bronto Burt's cameo in the background of the Dream Land stage. Kirby in the Melee version of Dream Land. Duck Hunt and the Nintendog on the stage in Ultimate. A poll conducted in 2004 among Japanese players showed that they considered Dream Land the most balanced stage in both Smash 64 and Melee. The wind that Whispy Woods produces is strong enough that it can blow characters off the two lower soft platforms, which can be used for spamming Taunt cancels in Smash 64. Because of Whispy's placement, it also has the ability to blow players off the left but not the right ledge, which allows for an interestingly unique tactic: one may be blown offstage into a ledge hang, followed by ledge attacks which may be spammed as the wind continues. This is especially effective for characters like Fox, whose ledge attack retreats slightly upon completion. This is the only Past Stage in Melee which appears before it is unlocked, as well as being the only Past Stage to appear in any mode other than Vs. Mode. If one counts the two versions of Super Smash Bros. 4 as different games, then this stage has the highest number of selectable appearances in the series, with five. However, if one does not count the two versions of Super Smash Bros. 4 as different games, then this stage is the only stage that has had a different availability in each game: Starter in Super Smash Bros., unlockable in Super Smash Bros. Melee, downloadable in Super Smash Bros. 4, and starter once again in Super Smash Bros. Ultimate. This is the only DLC stage in the 3DS version to not use wooden Crates and Barrels, mostly because of its fantasy design. This is the only Smash 64 stage in Smash 4 where the background image functions identically to the original whereas the other stages feature wrapped skyboxes. This page was last edited on April 15, 2019, at 02:07.